J.P. Morgan Chase's Jamie Dimon made $18.7 million last year, putting him fourth on the list of highest-paid chiefs in banking. Which CEOs made even more? Total compensation is calculated as the sum of base salary, discretionary and performance-based cash bonuses, the grant-date fair value for stock and option awards during the fiscal year, and other compensation like benefits and perks. Equilar, an executive compensation research firm, looked at CEOs at banking companies in the S&P 500 index that have filed a proxy statement as of April 30, 2013. Pay data based on companies' fiscal year end of Dec. 2012 unless otherwise noted. 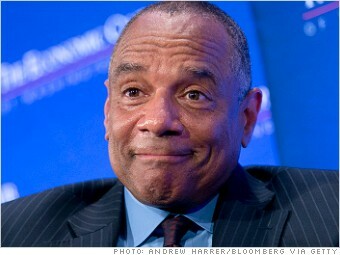 See more on Ken Chenault from Equilar.